Today’s “Young Guns” segment features a stand out from the “Great White North” (or Canada, for our non-American readers). Hailing from Halifax, Nova Scotia, Joshua Presley is one of the top BJJ representatives from Canada’s eastern most Provence. 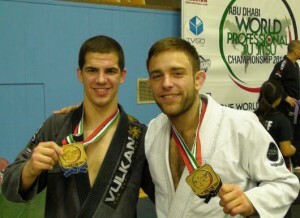 Since he started Jiu Jitsu four short years ago, Presely has collected medals from international competitions such as the Mundials, the NY Open, Miami Open, Lutador and the Abu Dhabi World Pro Trials. Joshua’s strong work ethic and his determination to win will take him very far in our beloved sport. Submission Control: How did you start Jiu Jitsu? Joshua Presley: I started when I was 17 years old. A year or so prior to getting into BJJ I was really out of shape (200+ pounds) and figured I needed a hobby/passion to turn my life around. I started really getting into health and fitness, and my goal was to get involved in some type of combat sport once I got in shape. I always liked watching boxing when I was younger. I wasn’t a huge UFC fan, but it was definitely what got me interested in combat sports (along with boxing). Originally was looking to get into Judo, because I thought it would be cool to throw people around, but couldn’t find any clubs around my area, but there were a few that were offering Brazilian Jiu-Jitsu. After doing a little bit of research I thought it would be really cool to get into a sport where size and strength really don’t play a huge roll, and you’re work ethic will be what defines you. I’ve been training hard ever since. SubCon: Who are your main influences? JP: In terms of style and technique I always look up to the guys who are the best black belts around my weight class. I’ve had the opportunity to train with Ryan Hall for a number of weeks over the past year or so and he’s really influenced me and motivated me to constantly improve my techniques and be able to adapt to all different types of situations. I’m also a huge fan of Marcelo Garcia. His attitude and passion for the sport is really inspiring. If there’s one guy I could strive to be like it’s definitely Marcelo. Cobrinha is awesome and I had the opportunity to train with him for a few weeks as well, he’s an awesome person. Jonathan Thomas who is a good friend of mine and a 2x world champion from Alliance Atlanta. I really look up to him as well. Finally, Jake Mackenzie has always gone out of his way to help me too; he’s a black belt from Cyborg’s and lives about 45 minutes away from me. When he’s home I always make sure to train with him as much as I can. That is just in terms of technique and elite players. In day-to-day training, all my teammates influence me. Kevin Taylor has been my coach for the past 4 years and he’s the best coach I could possibly ask for as well as one of my best friends. If it wasn’t for him I wouldn’t have been able to accomplish anything. He has tons of experience and is one of the coolest people I’ve ever met. Jonathan Gale was one of my first coaches as well, he’s also currently a purple belt, and he always went out of his way to help me when I first started. He helped me improve quickly and gave me the confidence to be a good competitor. Chris White and Josh Wincey are also two of my best friends, and I can always count on them to help me train for whatever is coming up (no matter what they have going on) I’m really appreciative of that. Everyone at Titans BJJ, I don’t have a single bad thing to say about anyone there. I’m always looking forward to seeing all of them compete, as well as doing whatever I can to help them improve. SubCon: How would you describe your style? JP: Attacking… I always want to submit my opponents, every single person I face. I’ve never gone into a match with a goal to get a sweep or a takedown and ride it out and win on points. Attack, attack. That’s what jiu-jitsu is all about in my opinion. Lots of guys have good technique and skills but just play the points and advantages game, which is super lame to me. I would rather lose a match that everyone wants to watch, than win a match by a single advantage point after stalling for however many minutes. I didn’t get into jiu-jitsu to be the best at stalling. I like competing, and I love competition. It’s frustrating sometimes competing against guys who don’t want to open up and play jiu-jitsu against you. Fight me like a man haha! If I lose then so be it, I’ve lost tons of times, but having an attacking, aggressive style and having people like to watch me compete is important to me. SubCon: You have won a lot of major titles in the past. Given that you do not come from a mega-team like Alliance, Gracie Barra, ect… what’s the secret to your success? JP: Just training hard. I don’t really feel like it’s a secret. It’s proven in jiu-jitsu that whoever trains and the hardest, and puts the most into it will get the results they want. That’s the charm of jiu-jitsu, it’s not like football or other sports where even if you work hard…there’s a big chance that you won’t make it to where you wanna be because you don’t have the physical attributes. Jiu-jitsu isn’t like that; you come to class, train hard, practice all types of different areas and positions, never give up or quit during training, always be respectful to everyone and look to learn from each person you train with. Everyone has something to offer whether they know it or not. Just always be learning, always be training. I also try and transfer a lot of what I learned about fitness and nutrition into my training which I think helps a lot. SubCon: Because you are from Nova Scotia, is it challenging to find top-level trainers/training partners to help you stay motivated and to keep you abreast of the newest positions being executed in tournaments? JP: Not at all. Just because my instructor isn’t a World Champion doesn’t mean that he can’t teach me anything. I have a great team that I’m really thankful for that has pushed me to achieve all of what I’ve done up until this point. It’s not a team full of elite black belts, but we’re a pretty tight team and have lots of fun training together. Of course it helps every once in a while to train with someone who’s super high level to get a different perspective on training and some different ideas, but I think dedication is more important than talent and skill in terms of training partners. All of my training partners are really dedicated, great people. In my experience and after watching and listening to guys who are at the top of the food chain in jiu-jitsu I’ve learned there’s no one ‘right’ way to do jiu-jitsu. Everyone’s perspective is a little bit different, so to me, it’s motivating to know that I can develop my own style and put my own little spin of techniques and it’s not necessarily wrong. SubCon: What has been your proudest moment you BJJ career? JP: Getting my purple belt. Belts are cooler than tournaments. Every time you get a belt it’s exciting because you’re being recognized for not one particular tournament or victory, but you’re whole body of work up until that point. Any time you can be recognized and appreciated for hard work it’s a great feeling. Also having all of your training partners and team mates to share it with you is cool too. It was also sweet to get 2nd at the Worlds but it would have been better if everyone was there. We had a big crew compete at the Abu Dhabi Pro Qualifiers in Montreal this year where I won my division and took second in the open. That was really exciting for me. Any time people cheer for you and really want you to win is awesome. Subcon: What can we expect from you in the future? JP: I’m a pretty busy dude; I’m currently a full time university student majoring in accounting, as well as working a part time job to pay for school, instructing classes as well as teaching…so expect me to be busy. I’m not a rich kid so I can’t compete at every tournament in the world, even though I would love to. But I take pride in being from a smaller area and still performing well on bigger stages even though I don’t have famous coaches or people paying for me and giving me a free ride. If I can swing it I want to compete in 2-3 major competitions in 2012, so expect me to be training hard regardless if I have anything coming up or not, and coming to win at anything I compete in. JP: Thanks to all my friends, family, and teammates for supporting me and helping me get better and grow as a person every day. You all mean more to me than you probably know. Getting involved in any type of martial art is great for your own personal development, even if you don’t compete in a single tournament. I’m thankful I got involved in jiu-jitsu, and really feel it’s given me a lot out. Great friends, great experiences. And finally, North End Top Team Taylor Gang Kill Them All! HAHAHAH!